Looking for best web hosting deals for 2019? Find best web hosting deals which will help you get hosting for even less than a dollar. Get 50% to 90% discount on web hosting products. Are you looking for the best web hosting deals for 2019? You’re in the right place. Whether you know it or not, choosing the right hosting is the first step to your website success as your hosting plays a key role in user experience and also website speed. If you want to launch a new website and looking to get huge discount on your hosting purchase, you are on the right page where you will get 50% to 90% discount on your hosting purchase. You’ll find plenty of web hosting deals where you can save more on all the hosting plans. Are you curious to find out the best web hosting deals for 2019? Let’s discuss about them without much ado. Hostinger is an incredible hosting provider which offers you excellent hosting solutions with useful features like optimized speed, easy to use website builder and so on. Personal free domains are included in annual Premium & Business web hosting plans on Hostinger. Here’s a list of some of the major features that are offered by Hostinger. If you’re looking for the cheapest hosting plans to start your website, Hostinger is a great choice for you and here are the pricing plans offered by them. Bluehost is the #1 shared hosting choice for most people which is hosting over 2 million websites worldwide. It is also considered as one of the most affordable hosting networks on the planet which offers excellent features. Here’s a list of some of the incredible features that you get with Bluehost hosting plans. Who’s this Bluehost hosting best suited for? If you’re looking for an affordable yet reliable hosting platform to host your sites, Bluehost is a great choice for you. Bluehost is currently offering the following pricing plans in shared hosting. If you’re a beginner and searching for a top notch web hosting environment that provides super faster hosting experience at affordable prices, SiteGround hosting is just for you. If you’re wondering about what are all the major features offered by SiteGround, here are few of them. Here’s a list of all the pros that you get with SiteGround hosting. Who’s this SiteGround hosting for? SiteGround is suited for all kinds of bloggers who are looking for affordable hosting plans which also speed up your site loading times. Here are the shared hosting pricing plans from SiteGround. StartUp costs you just $3.95 per month where you can install 1 website where you’ll get 10 GB of website space and perfectly suited for 10,000 monthly website visitors. This is perfect for newbies. GrowBig costs you $5.95 per month where you can install multiple websites with 20 GB website space and suitable for up to 25,000 monthly visits. This plan is great for bloggers. GoGeek costs you $11.95 per month and you’ll get 30 GB space which is suitable for traffic up to 100,000 website visits a month. It is great if you want more space, speed and security. WPX hosting is the same hosting we’re using here at Bloggers Passion. If you’re someone who’s looking for blazing fast website loading times, WPX hosting is the PERFECT hosting solution for you. Important: Please use our personal promo code BloggersPassion (caps matter). It will give you a 50% INSTANT discount for the first month on all of WPX hosting plans. Read: Unbiased WPX Hosting Review With 50% OFF: Is It Worth Paying For In 2019? WPX hosting is bit expensive when compared to most of other hosting sites included here on the best web hosting deals 2019 list. Who’s WPX hosting best suited for? If you’re looking for the fastest, reliable and secure hosting environment to host your WordPress sites, we HIGHLY recommend WPX hosting. Yes, it will cost you few more bucks when compared to platforms like Bluehost or HostGator, but it’s worth every single penny you pay for. HostPapa claims to be the Canada’s #1 web hosting company which is hosting over 500,000 sites worldwide and offers you 24/7/365 customer support experience. HostPapa offers one click installation support and customer support is provided 24/7 through live chat, phone and email. However, it’s only in weekdays. Who’s this HostPapa hosting suited for? If you’re looking for an alternative to hosting sites like Bluehost and HostGator or looking for a non-EIG group of hosting companies, HostPapa is a great fit for you which currently offers you the following pricing plans. Starter plan costs $3.95 per month where you can host two websites, provides 100GB of disk space and ‘unlimited’ bandwidth. A2 Hosting is one of the top class hosting platforms which offers exclusive Turbo Servers which help you get page loads up to 20 times faster than standard hosting. So if you’re looking for more speed and top performance, A2 Hosting is a great choice for you. Here’s a list of some of the incredible hosting features offered by A2Hosting. Launch your website with A2 Hosting for $3.92/month only now. A2 Hosting is great for beginners who are looking for turbo speed hosting environment at affordable prices. A2 Hosting is offering the following 3 pricing plans. Lite plan which costs you $3.92 per month where you can install 1 website, get up to 5 databases, 25 email addresses, unlimited SSD disk space, unlimited data transfer/bandwidth, and a free (shared) SSL certificate. WP Engine provides managed WordPress hosting which is optimized exclusively for WordPress platform. If you’re looking to launch a WordPress site, you should definitely consider WPEngine hosting. Here’s a list of some of the great features offered by WPEngine. Who’s WPEngine best suited for? If you’re in a hunt for the premium hosting environment which gives you superior speeds and top notch security, WPEngine is a great fit for you. WPEngine offers you 3 pricing plans which are listed below. Flywheel was founded in 2012 with the intention of improving the lives of the millions of web designers and developers worldwide that build sites on the WordPress platform. So obviously, FlyWheel is a great hosting solution for all kinds of website designers and developers. Here are some of the features that you get with FlyWheel hosting plans. To protect your website’s important information, FlyWheel provides password protection feature. With its site cloning feature, you can clone an existing website which reduces the time and effort needed to create a new website. Who’s it FlyWheel hosting for? FlyWheel is exclusively for website designers and agencies looking for the superior performance. It offers multiple pricing options you can check out from their site but here are the single site hosting plans. Kinsta is a superior managed WordPress hosting provider that offers super fast hosting environment and provides managed hosting services so you can focus on what matters to you the most which is blogging or website building. Powered by Google Cloud Platform which is the same technology that Google uses, so you are in great hands! Who’s Kinsta hosting suitable for? Starter plan comes at $30 per month that provides 1 WordPress install, can handle up to 20k visits, offers 5GB disk space and provides free SSL and CDN. Pro plan comes at $60 per month which offers 2 WordPress installs, handles up to 40k visits, offers 10 GB space and provides free SSL and CDN. Business plans come in 4 different plans where the pricing starts at $100 per month where you can get 5-40 GB of SSD storage, 1-4 free site migrations, 50-400 GB of server bandwidth. If you are running around 20 websites then you should opt this plan. Enterprise plans again come in 4 options starting at $600 per month and offers the amount of bandwidth these servers handle is around 600-1,500 GB. It allows you to run 40-100 WordPress sites and offer 80-200 GB of SSD storage. iPage is another ultimate web hosting and domain registration company which is owned by the same Endurance International Group (EIG) which owns Bluehost, HostGator and so on and it is operating in the hosting industry since 1998 which is over 2 decades. Here’s the features list of iPage hosting. Who’s iPage hosting most suited for? iPage offers free domain name along with $200 marketing offers and also speed and easy hosting environment which is great for beginners. iPage currently only offers one shared hosting plan which costs $1.99 per month when you first sign up and can cost up to $9.99 per month when it is time to renew your hosting. Here are some of the important questions you might want to know around web hosting deals for 2019. 1. Which is the best budget friendly hosting platform? If you’re looking for the budget friendly hosting sites, you should go for Bluehost or SiteGround as both these hosting platforms offer you exceptional hosting features without compromising the quality, speed and performance and great for entry level websites. 2. How to choose the best website hosting plan? So are you wondering about how to choose the RIGHT hosting plan for your website? We’ve few quick tips for you. Before picking any hosting plan, make sure to consider your budget and website needs. If you’re looking for cheap hosting sites, go for sites like Bluehost, HostPapa, Hostinger or if you’re looking for super fast sites with managed hosting, you should pick hosting plans from WPX hosting, Kinsta, WP Engine and so on. Although they are bit expensive but they are worth every penny. That said, make sure to check the following things while choosing a hosting provider to host your sites. 3. Can I switch hosting plans later? Yes, at any time. Almost all of the hosting companies mentioned here offers you anytime plan upgrading or downgrade. Most hosting companies also make it extremely easy to upgrade (or downgrade) plans. For instance you can start on the basic hosting plan, and upgrade to the advanced plan as your website gets more traffic. 4. Should I go for managed WordPress hosting? Managed WordPress hosting sites offers you a lot of comfort since they take care of all the details around performance, security and updates, meaning you don’t need to worry about technical details. 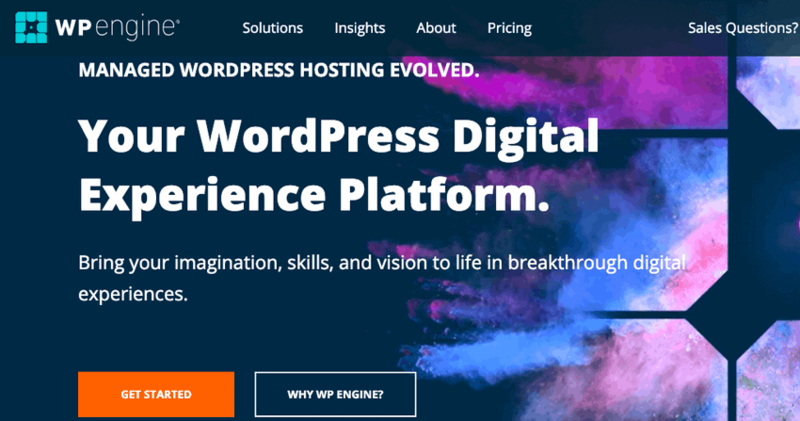 That said, if you’re looking to launch a WordPress site, you must prefer managed WordPress hosting choices like FlyWheel, WPX hosting, WPEngine and so on. 5. What is website bandwidth in hosting? Bandwidth is a measure of the total traffic in and out of your site in a given month. Each hosting plan offers you a limit based on the number of gigabytes that can be transferred each month. Even the hosting platforms that offer you unlimited bandwidth don’t offer you unlimited bandwidth technically as they all put a threshold limit on the usage. 6. What’s an SSL certificate? An SSL Certificate is a text document with encrypted data that you just install on your server so you can secure and encrypt sensitive communications between your website and your customers. You can install SSL from your hosting platform (most hosting companies are now offering free SSL). An SSL certificate also makes your site go from http to secured https version. For years, we’ve dealt with so many hosting companies ranging from HostGator to Bluehost to SiteGround to WPX hosting. That’s the reason why we only mentioned top 10 best web hosting sites that offer you excellent features. If you’re looking to launch your site now, you must have a look at the top 10 web hosting deals for 2019 to save upto 90% money on your web hosting purchase. If you still have any questions, do let us know in the comments. Thank you for the web hosting deals. All of then are Shared Hosting, none of the offers are for cloud Hosting, but still good options for website that don’t need scalability and don’t will have traffic spikes. thanks for the share, it really helped me a grab good discount on Bluehost. Thanks for sharing such an amazing web hosting deals with detailed features of each web hosting provider. By the way, could you advise which bluehost plan is beneficial (i.e. plus or choice plus)? What’s your views on add-ons like sitelock security and codeguard basic of bluehost? Hi Niraj, glad you liked it. Make sure to grab any of the best hosting deals so you’ll save a ton of money and these deals won’t come too often. Thanks for this amazing web hosting list! Really huge discount ever.. Thanks for sharing Christmas Web Hosting Deals. I think BlueHost is best web hosting provider but if someone looking for a cheap hosting provider, iPage can also be the best option with hostinger.